On the one hand, I am happy that I’ve been able to live this experience, of which I had a lot to learn, and that helped me to discover and develop myself as a person. I can say that now I am more self-confident, I have exceeded my boundaries many times, doing things that I would never have imagined to be able to do. I’ve stepped out of my comfort zone countless times, challenging myself, that’s why now I’m so proud of myself. But as I said, at the same time I am also sad because my time in Turkey has come to an end. Today was the last day I went to school, the last day in which I was able to talk to those wonderful teachers and to say goodbye to them. Here, I had the opportunity to see how any school should look like. Not only the teachers and the students, even the staff, from the porter to the ladies at the canteen, behaved with me very nicely, making me feel special. I’m really going to miss it very much. 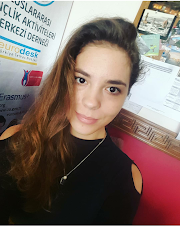 I have three more days in Ankara, in which I want to take advantage of everything, and hang out with my friends that I’ve met here, wonderful people that I hope to meet again in my life. Even though there were some moments when I was not the happiest person in the World and I had to face some problems here, I do not regret any moment the decision to do this EVS. I had something to learn from everything and from everyone, and all the experiences here, whether good or bad, helped me to improve myself. So guys, if you want to apply for an EVS and you are not sure or you want to know more about it, you can always ask me about my experience, it would be my pleasure to help you if I can. Here is my instagram where you can write to me: annamarias.1996 :).